American Express has been marketing the first Saturday after Thanksgiving as a day when we're all supposed to support the small business community. It's a great initiative for those who might not think to shop small otherwise, but frequent Flea followers are no strangers to supporting local folks on the regular during Flea events. As creative community caretakers, the staff at The Cleveland Flea and Indie Foundry wanted to make that opportunity even more accessible. That's why we created fleaandfoundry.com. At Flea + Foundry, favorite local flavors are now available for purchase online and in one place. No matter where you're located in the world you can shop a curated collection created by local makers–including selections of limited edition products and Flea+ Foundry exclusives–during seasonal sales listed online for a limited period of time. So, can you blame the staff here at headquarters for doing a bit of browsing for ourselves? Enjoy our team F + F picks from the Holiday 2016 collection. Maybe a few of will make your list, too? Tell us more: "It's perfectly-matched to my style. Most everything I wear is black and gold, so I just couldn't pass it up! It's also the softest leather I've ever touched. I can see myself using this for my days that run from office work straight into networking / mingling." Tell us more: "I want all of her candles! They’re so fragrant, you can smell them in the room without them even being lite yet. I love that this set is dedicated to brunch scents. Plus, two candles is always better than one." Tell us more: "2nd Shift Design has always been one of my favorite makers. All of their pieces are skillfully designed with modern, clean lines while maintaining what I like to call a "cozy" look. Their high quality hanger frames have been my favorite piece for a while now, providing me with a more streamlined solution to framing that show cases my favorite prints and compliments my modern, eclectic decor." Tell us more: "Since moving back to Ohio from a seven-year stint in Texas, I've grown to miss the wild and wonderful ways of western ware. 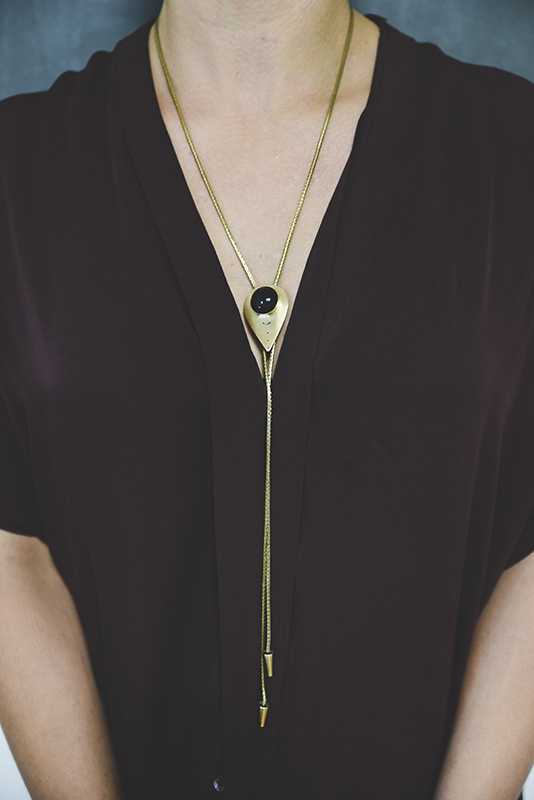 Océanne relights that fire with their polished take on a bolero tie, featuring a dark onyx center stone that matches the rest of my wardrobe... I really like black." Tell us more: "I love vintage! I wouldnt think twice about adding this unique piece to my wardrobe! It's the perfect dress-length coat for any social event. The fabric is heavier than it looks... which will keep you warm party-hopping on New Year's Eve!" Shop this season's collection and make your own list.